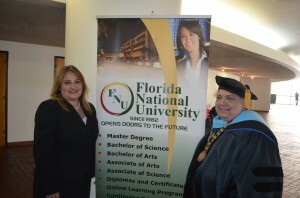 On October 5th, 2014, Florida National University held its Fall 2014 Commencement Ceremony in the James L. Knight Center in downtown Miami, Florida. More than 300 guests (friends and family members of the proud graduates) watched as 150 Florida National University students made the time honored transition from student to alumni. Furthermore, they were also treated to a very special keynote speaker: Ms. Mary Gomez. Ms. Gomez not only graduated from FNU, continued on to pursue her law degree, recently ran for the office of Miami-Dade County Circuit Judge, and was a faculty member at the University. Here is her very moving commencement speech. My Name is Mary Gomez. I am proud and honored to be the guest speaker at this commencement ceremony especially since I am at my alma mater. I am a Florida National University graduate, class of 1989. I leave you to do the math. I also had the honor of being an adjunct instructor in 2010-2011. When I started attending, the name of the school was Florida International College. By the time I graduated, the name had been changed to Florida National University. But now, Florida National is a “University”. The school has come a very long way… my class graduated in a small banquet hall in Hialeah. Now you are all here sitting at the James L. Knight Center. You should be very proud to be a graduate from this University. You should also be very thankful to all those that helped you make this day a reality. Especially, our family members, they are usually the ones that are our strongest support system. When I graduated, the school did not offer Baccalaureate degrees let alone Master degrees as they do today. I graduated with an Associate Degree in Legal Studies and had to leave the school in order to obtain a Bachelor’s Degree. Subsequently, I attended law school and graduated with a Juris Doctor in 1995, in the top 3% of my law class, in spite of being told that I would not be able to accomplish much with a degree from this school. I have to attribute a lot of my success in law school, and in my practice, to what I was taught by the wonderful professors at Florida National, some of whom I have kept in touch with to this day. My hope today is that my speech will not just be another boring graduation speech where you are staring at your watches waiting for it to be over so you can go on to get your diplomas, or, even worse, that you find yourself dozing off. I want you to feel inspired and motivated by the end of this speech because what I have accomplished being a graduate of FNU, you can do as well and so much more. So my goal is to not let you down. I also promise not to go over my 10-12 minutes. As I was getting ready to prepare the speech I started to think, what were they thinking when they asked me to speak? I did not feel qualified to be the guest speaker at a graduation ceremony. When I received the e-mail asking me to speak, I was in the midst of one of the most challenging things I have done in my entire legal career. I threw my hat into the political arena and decided to run for judge. And, by the way, Florida National was incredibly supportive of my efforts. When I received the e-mail asking me to speak sometime in July, I immediately said “Yes,”… as I felt honored… then after I lost the election at the end of August… I felt like “Oh No, why did I say yes?” Honestly, I felt embarrassed. I am supposed to speak words of inspiration to a group of new graduates, and I lost the election. It would have been so much better if I could have stood up here and told you that I won and was on the way to be your next judge. But it did not work out like that… I got 43% of the votes, when 51% was necessary. But what a life experience a year of running for office has been. The experience taught me above all else that “a position” does not define me. Not even being a lawyer (which is what I wanted to be ever since I can remember) defines who I am … That, is what I do, not who I am… I urge you not to allow a degree or a position to define who you are. It is no coincidence that God has me writing this speech at this point in my life…. I am giving you advice on how to succeed, when I do not feel like much of a success, and I am in the process of reinventing myself, yet again. But that is what life is all about… For some of you that may have come to Florida National looking for a second career, you know what I am referring to. Another life lesson I learned this past year is that in life we are way too concerned with reaching a “destination” when what we should really put our focus on is the “journey”. After all, we spend more time in the valleys than we do on the mountain tops… It is perfectly okay to enjoy and celebrate your victories (the mountain tops) but what I want to convey with this message is that you learn how to enjoy life and be your best even when you are in the valley, when you are on the journey… Do not allow your circumstances to dictate how you feel or how you act. Do not wait to reach your destination to be happy. Always excel to do and be your best regardless of the circumstances. It is highly likely that you are going to spend most of your life somewhere in the valley… Somewhere working towards the desired destination… When we accomplish something we have been working on (like for you today- graduation) or we find a resolution to a problem we had, or we acquire something we have been wanting … something else shows up on the scene and we start back up again… I am not telling you this to be negative. Quite the contrary, I want you to always have a positive attitude, but I want this speech to be realistic. You do not need another cliché message. I am telling you what I wish I would have heard 25 years ago when I was sitting where you are sitting. You all come from different walks of life. For some of you the road that has led to today has been easier than for others. For some of you, it has been so difficult that you did not think you were going to make it. There were times when you wanted to throw in the towel but some “one” or some “thing” kept you going, and here you are today. You are on a “mountain top”. Rejoice and enjoy your victory. The best things in life are the ones that cost us the most sacrifice. It is a great feeling of accomplishment to graduate with a desired degree, but often times after graduation we are left without direction… not knowing which should be our next step. You now have the advantage to start with a blank canvas, paint on it whatever you desire, but make it GREAT… I would like to challenge you to get the most you can get out of your degree. For some of you it may mean to go on to get a higher degree, and yet for others it may be to go out into the real world, to venture into the job market. Things are tough out there. Our country is still struggling trying to get out of a severe economic depression. That is why now more than ever you have to position yourself to be the best that you can be. You have to be competitive and make yourself attractive to employers. Do not allow anyone to tell you that you cannot or will not make it out there because you graduated from a small private University. The best way to accomplish your goals is TO SIMPLY BE YOURSELF… be a person of honesty and integrity. Also have a plan for your life, do not just make things up as you go along. You have all heard the saying… “If you fail to plan… you plan to fail…” This does come with a disclaimer. I would caution you however, as much as you can plan, leave room for modification as life does not always turn out the way we expected. The key is not to avoid falling, because you probably will and more than once, it is to get up each and every time with more drive and determination than you did the last time. I have learned that I am most comfortable when I am being myself. I would be terrible at being you and you would be terrible at being me. Trying to be someone you are not is exhausting and leaves you empty and unfulfilled. And most of the time, people can see right through you. When you go out into the world, plan and purpose that you will do whatever you are called to do with passion and excellence. When you are passionate about what you are doing, it will show… it will not just be a job to you, and you will be a better person for it. Go into the work force with the desire to leave everywhere you go better off than when you found it. As a professional and an employer myself, I can tell you that there are a lot of people with college degrees but few with the desire to truly do quality work, and that is usually because their hearts are not really in it. To make a difference you have to “care”, and to do that, it is paramount that you are doing something that you LOVE. It is a great feeling, not to mention a privilege, to be paid to do something that you love. It is awesome to get up every morning excited about going to work and making a difference, not just getting up because you need a paycheck. You did not graduate from high school after 13 years of schooling and go on to college for 2 to 4 more years to feel that way. You owe it to yourself, but also to those around you, to work with passion and purpose. If at some point you feel that you are not getting that out of the career you chose or the employment you have, and that does happen sometimes, pursue and go after what fulfills you. For those of you that have not been out into the real world yet, it can be very scary and intimidating. While we are in school, we are in a safe environment. But when we have to stretch and go beyond our comfort zone that is when we feel trepidation. I challenge you not to give in to fear. And even “if” you feel afraid, well “when” you feel afraid, because you will feel fear at some point… DO IT AFRAID. Sometimes if you wait until you do not feel fear, you will never do it. People often times misunderstand the word “courage”. Being “courageous” does not mean that you do not feel fear; it is not allowing fear to stop you from doing what you set out to do or from starting over. Fear will paralyze you if you let it and you will never know what you are capable of. When you step out in spite of your fears, the experience sharpens you. It challenges you and makes you stronger. When you run away from fear instead of facing it head on, you also run away from the opportunity to be your best possible self. May the Lord bless you and keep you. May He make His face shine upon you.